“Throughout our Norwegian literature we hardly find any poet with such a sumptuous rhythmic talent as Petter Dass. He is not the most refined poet, but it is a drive in his language that can bring to mind the baroque master Johann Sebastian Bach.” This is the literary historian Per Thomas Andersens description of Petter Dass‘ poetry. In Petter Dass‘ texts, we find the full spectrum of moods: seriousness and wisdom, humor and exuberance. His literary imagery is characterized both by knowledge of classical literature, Greek and Roman mythology and local references. Petter Dass was both North Norwegian and European. Perhaps that´s why his writings have been devoted to so much attention through more than three hundred years. Of all Petter Dass poet works, we know of only one poem that is preserved with his own handwriting, namely his request on the rim of his colleague Peter Bredal in Brønnøysunds to terminate the theological discussion, they had generally been in Latin. The poem is titled Alle lappaliers begrafelse and is preserved by Gunnerus Library in Trondheim. The portrait on the right hand has been thought to be the priest and poet Petter Dass. 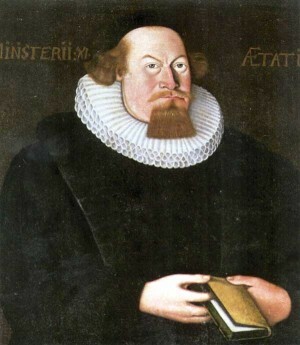 The original portrait hangs in Melhus church in the south of Trøndelag. We do not know of other portraits of Petter Dass today. During recent years there has been a discussion about if it´s really Petter Dass and not the Melhus priest Oluf Mentzen Darre. The portrait has no signature and the artist name is unknown. The painting still has some interesting information that is supposed to indicate how old the priest at the picture is, and how long he has been in service. The inscription is in Latin, Ministerii XI and Aetatis XXXVII, and would indicate that the portrayed person had been in service for 11 years and was 37 years old when the picture was painted. It was the philologist Andreas Emil Erichsen (1841 – 1913) who connected the portrait to Petter Dass at the release of Petter Dass‘ collected works in the early 1870´s while starting the investigations of possible existing portraits of Petter Dass. It emerged that a portrait had existed on the farm Skei of Alstahaugvågen, but it has been destroyed. On Alberhaugen by Alstahaug church and the Petter Dass-museum there is a stone monument. It is dedicated to Petter Dass. It was the peasant Johan Bech Slåtterøy at Alstahaug who got the idea of ​​a monument in 1890. The monument was erected on august 26th, 1908 in the belief that one also marked the 200th year of Petter Dass death. All the major national newspapers were present and a number of famous people too among them Bishop Bochman. The author Jonas Lie and his nephew, the author Bernt Lie, both wrote a song each that was sung during the happening. The memorials was designed by architect August BC. Nielsen, while the bronse piece of it was modeled by Georg Andreas Heggelund. The artist Gustav Vigeland also made ​​several drafts of a monument.